The Civil Aviation Authority of Macao SAR invited an international aviation security expert to pay a four-day visit to Macao from 08 to 11 April 2019 to review the airport hold baggage screening policies and the express link facilities so that he will make recommendations on enhancing the security operation standard in the Macau International Airport. Upon invitation by the Civil Aviation Authority of Macao SAR (AACM), an international aviation security expert paid a four-day visit to Macao and reviewed the airport hold baggage screening policies and the express link facilities. AACM and the industry operators will listen to the recommendations made by the expert on enhancing the security operation standard in the Macau International Airport. As a member of the Steering Committee of the “Cooperative Aviation Security Programme – Asia Pacific (CASP-AP)”, which is run by the International Civil Aviation Organization (ICAO), AACM presented to the CASP-AP during the Programme’s 2018 Annual Meeting to invite an expert to conduct a comprehensive review of the present hold baggage screening policies and the express link facilities for the Macau International Airport, in order that the expert can propose improvement measures aiming for the ultimate goal of enhancing Macao’s aviation security standard. The expert carried out the mission from 08 to 11 April 2019, working closely with AACM and meeting the representatives of CAM-Macau International Airport Company Ltd., SEMAC Security Company, Menzies Macau Airport Services Limited and the shuttle bus service providers for the express link to understand the relevant systems and the operations. The expert will work on the final report and submit it to AACM later, listing the recommendations for improvement. The expert for this mission is the programme coordinator and the senior aviation security advisor for the CASP-AP, Mr. Kyal Barter. Kyal has previously served the Australian government with focus on the transport security; he also has an aviation background including experience in the military, airborne surveillance operations, and air traffic control. 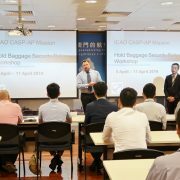 After assuming his responsibility with the CASP-AP, he has lectured in a number of countries and places, including Macao, on aviation security instructor courses. Kyal was also invited by AACM to conduct a workshop in Macao in 2018 to review the current cargo security operations for the aviation industry. With Kyal’s good grasp of Macao’s aviation security operations given his previous missions here, AACM is confident that he will be able to propose improvement measures that are beneficial to and practicable for Macao’s aviation.